A dental bridge is a type of dental restoration that can replace one or more teeth. Artificial teeth are anchored in the mouth by joining them to adjacent teeth or to an implant. To strengthen the bond, crowns are placed on the abutment teeth – those on either side of the bridge. The purpose of a dental bridge is to restore function and appearance of the teeth, especially when multiple consecutive teeth are missing. Bridges are so strong, they can even replace back molars. Their durability makes them a popular option for patients of many ages and backgrounds. How Does the Dental Bridge Procedure Work? In an initial visit, the patient’s abutment teeth will be prepared. This requires some enamel on the surface of teeth to be removed, ensuring a secure fit with future crowns. Impressions of the teeth are then made so the crowns, bridge, and artificial teeth can be fabricated. A temporary bridge is often inserted at this time. It may be cemented into place. During the second visit, the temporary bridge is removed. 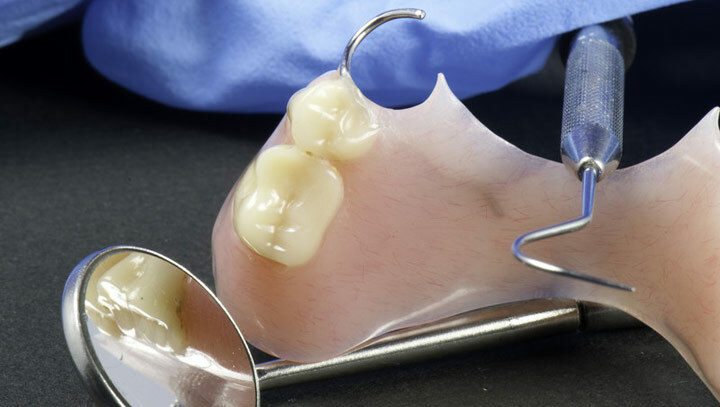 The new porcelain or metal bridge is inserted and adjusted as necessary for a proper fit. The bridge framework and resulting bite must match each patient’s individual needs. It can sometimes take a few follow-up visits to get the fit exactly right. Bridges are a common and effective dental treatment. To improve comfort and get the results you want, it’s important to see an experienced local dentist. To find out more about bridges or other dental treatments that may help you, contact Coscarella Family Dentistry today.